ST (“Suspension Techniques” apparently) is KW’s newest brand in Europe. KW have been offering suspension products under the ST name in America since 2005 and now the the brand is taking over from Weitec worldwide. ST Coilovers offer the same combination of KW damper technology, durable stainless housings, and outstanding value as their Weitec products but have a generation newer damper technology wet build damper technology, offering a smoother ride. You're still benefit from KW’s second-to-none attention to detail and approach to quality. 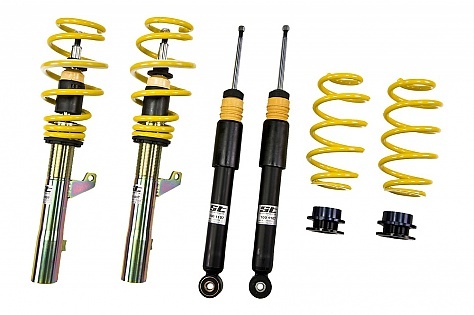 The ST-X range are fixed damping coilovers offering individually on-car adjustable lowering. The amounts indicated are fully TUV approved and tested for road use. Damping levels are finetuned in-house by KW’s expert suspension engineers and are selected for each individual application with real world road use in mind. Likewise, springs are carefully selected from KW’s range of fixed and progressive rate springs and designed to offer an ideal mix of ride quality and dynamic ability tuned for daily-driver use. Although obviously much lower than stock suspension, these coilovers retain a large amount of suspension travel enabling them to properly damp bumps without crashing or jarring for that high-end suspension feel. The galvanised finish is designed to stand up to the toughest weather conditions whilst allowing them to offer these coilovers at a truly outstanding price. KW are so confident of the quality of this product that they're offering the same 2 Year warranty as on all of their other products.